In May this year, a huge company listed on the London Stock Exchange found itself in the midst of controversy about a prison it runs for the government – Thameside, a newly built jail next to Belmarsh, in south-east London. A report by Her Majesty’s Inspectorate found that 60% of its inmates were locked up all day, and there were only “vague plans to restore the prison to normality”. The prison campaign group the Howard League for Penal Reform talked about conditions that were “truly alarming”. Two months later, the same company was the subject of a high- profile report published by the House Of Commons public accounts committee,prompted by the work of Guardian journalist Felicity Lawrence. This time, attention was focused on how it was managing out-of-hours GP services in Cornwall, and massive failings that had first surfaced two years before. Again, the verdict was damning: data had been falsified, national standards had not been met, there was a culture of “lying and cheating”, and the service offered to the public was simply “not good enough”. Three weeks ago, there came grimmer news. Thanks to its contracts for tagging offenders, the company was now the focus of panic at the Ministry of Justice, where it had been discovered that it was one of two contractors that had somehow overcharged the government for its services, possibly by as much as £50m; there were suggestions that one in six of the tags that the state had paid for did not actually exist. How this happened is still unclear, but justice secretary Chris Grayling has said the allegations represent something “wholly indefensible and unacceptable”. The firm that links these three stories together is Serco. Its range of activities, here and abroad, is truly mind-boggling, taking in no end of things that were once done by the state, but are now outsourced to private companies. Amazingly, its contracts with government are subject to what’s known as “commercial confidentiality” and as a private firm it’s not open to Freedom of Information requests, so looking into the details of what it does is fraught with difficulty. But the basic facts are plain enough. 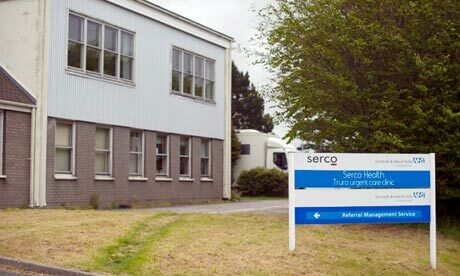 As well as five British prisons and the tags attached to over 8,000 English and Welsh offenders, Sercosees to two immigration removal centres, at Colnbrook near Heathrow, and Yarl’s Wood in Bedfordshire. You’ll also see its logo on the Docklands Light Railway and Woolwich ferry, and is a partner in both Liverpool’s Merseyrail network, and the Northern Rail franchise, which sees to trains that run in a huge area between the North Midlands and English-Scottish border. Serco runs school inspections in parts of England, speed cameras all over the UK, and the National Nuclear Laboratory, based at the Sellafield site in Cumbria. It also holds the contracts for the management of the UK’s ballistic missile early warning system on the Yorkshire moors, the running of the Manchester Aquatics Centre, and London’s “Boris bikes”. As evidenced by the story of how it handled out-of-hours care in Cornwall, it is also an increasingly big player in a health service that is being privatised at speed, in the face of surprisingly little public opposition: among its array of NHS contracts is a new role seeing to “community health services” in Suffolk, which involves 1,030 employees. The company is also set to bid for an even bigger healthcare contract in Cambridgeshire and Peterborough: the NHS’s single-biggest privatisation – or, if you prefer, “outsourcing” – to date, which could be worth over £1bn. But even this is only a fraction of the story. Among their scores of roles across the planet, Serco is responsible for air traffic control in the United Arab Emirates, parking-meter services in Chicago, driving tests in Ontario, and an immigration detention centre on Christmas Island, run on behalf of those well-known friends of overseas visitors the Australian government. 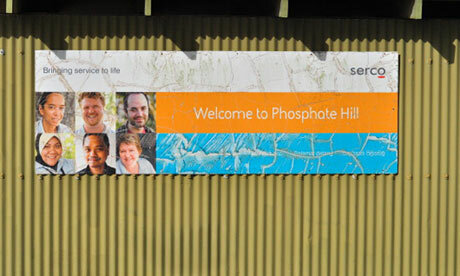 In the US, the company has just been awarded a controversial $1.25bn contract by that country’s Department of Health. All told, its operations suggest some real-life version of the fantastical mega-corporations that have long been invented by fiction writers; a more benign version of theTyrell Corporation from Blade Runner, say, or one of those creations from James Bond movies whose name always seems to end with the word “industries”. The strangest thing, though, is the gap between Serco’s size and how little the public knows about it. Not for nothing does so much coverage of its work include the sentence “the biggest company you’ve never heard of”. I first heard Serco’s name about eight years ago, when I was just starting to understand the amazing growth of what are now called “public service companies”. Once I started looking, their logos were everywhere, suggesting a shadow state that has since grown ever-bigger. Their names seemed anonymously stylised, in keeping with the sense that they seemed both omnipresent, and barely known: Interserve, Sodexo, Capita, the Compass Group. Serco is among the biggest of them all. At the last count, its annual pre-tax profits were up 27%, at £302m. In 2012 alone, its British workforce grew by 10,000, to 53,000 people (tellingly, as many as 90% of them are said to be former civil servant employees). In terms of employees, that makes it more than twice as large as the BBC, and around 20% bigger than Philip Green’s Arcadia group. A very significant player, in other words, and one that has come a long way since its foundation 1929, when it was a branch of the American RCA corporation called RCA Services Ltd, involved in the then booming UK cinema industry. It was renamed Serco in 1987, after a management buy-out, and floated on the stock exchange the following year. In the 25 subsequent years, during which the UK has grown ever-fouder of outsourcing and privatisation, Serco has grown at an amazing rate. The current chief executive of the global Serco Group is 49-year-old Chris Hyman, born in Durban, South Africa. His annual remuneration is around £700,000, plus bonuses; in 2011, the value of his total package rose 18%, to £1.86m (the company’s finance director had to slum it at £948,295). Meanwhile, other people are reportedly quitting their jobs, and the service given to patients is said to be getting worse. “In my team alone, we’re 50% down on staffing hours compared with last year,” says one former NHS worker, who provides home-care to patients who are largely elderly. Thanks to poor morale, she says that the team in which she works has lost around a third of its staff, and she is also having to see to administrative tasks that were previously carried out by someone else: in addition, she claims, support for a new IT regime is “farcical”. The NHS is a relatively new area of controversy for Serco, but concerns about their practices run across many other areas. Right now, the controversy over alleged overcharging, focused on both Serco and its fellow tagging- contractor G4S, seems to have only just begun. When thenews was made public, 8% was wiped off Serco’s share price. The Cabinet Office has announced a review “into government-held G4S and Serco contracts to ensure that contracts are well-managed and in good order”, which will report in the autumn. Work for the British government accounts for 40% of Serco’s revenues; to quote from the Daily Telegraph. “Without Serco, Britain would struggle to go to war”. That gives you some idea of how deeply its work penetrates the state, and how unthinkable any kind of corporate crisis would be. There are even bigger issues at stake, though. “There’s also the inability of the public sector to monitor effectively,” she says. “The Cornwall story came to light because of a Guardian journalist and a whole load of whistleblowers. Which is nuts: a crazy way for the public sector holding to account the private sector when it’s delivering public services.” Even her committee, she says, cannot break through a great wall of commercial confidentiality, and look at what the companies delivering pubic services are up to – not just in terms of their bids for public services and contracts with government, but such vital matters as their costs, and the profits they make from particular jobs. to us in 2012, which we were under no obligation to do.” All told, I was assured, their service “delivers a high standard against the national quality requirements”. On the allegations about what has happened since Serco took over community healthcare in Suffolk, and the claim that any new starters aside from clinical staff are on inferior terms and conditions, the same spokesperson said that such employees are “offered contracts in line with Serco standard terms and conditions which are market comparable”. He denied that anyone had been cut out of treatment at home, said that the company had “recently realigned our clinical teams across Suffolk according to the needs of the areas in which they deliver care” and claimed that new IT systems are being implemented “slowly and carefully”. The controversy surrounding Thameside prison, they said, had been followed by “a series of initiatives” including a “gangs strategy”, and measures to help prisoners with mental-health issues. Some people were now allowed to be outside their cells “during the core part of the day”, and in August, Serco anticipated that this would be extended. As for the ongoing story about overcharging for their tagging contract with the Ministry of Justice, Serco said this: “We are working with our customer, the Ministry of Justice [on] this matter so there is very little we can add at this stage.” I was also directed to a statement from Chris Hyman, which said the company “will not tolerate poor practice and behaviour and wherever it is found we will put it right”, and reminded that justice secretary Chris Grayling has said he so far has “no information to confirm dishonesty had taken place” on the part of either Serco or G4S. There was one last question, concerning the amazing spread of what Serco sees to, from parking meters, through nuclear early warning systems, to an expanding share of the NHS. Is there any limit to the fields they work in? That’ll be a no, then.